If experiencing the thrill and exhilaration of flying is one of those "I'd really like to give that a go one day" ideas that surface when you see an aircraft fly overhead, then today is the day to give it a go, an ultralight is the aircraft to do it in and Holbrook Ultralight Club has the flight training facility to make it happen for you!! 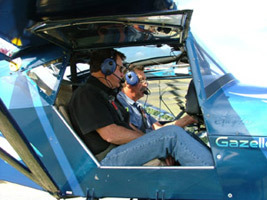 Ultralight aviation is recreational flying in the true sense of the phrase and for as little as A$100 you can experience all the excitement of piloting an ultralight by taking a trial instructional flight in a factory built and certified two seat training aircraft with a qualified instructor. It'll put a smile on your face that will last for days!! If you are interested in finding out a bit more about learning to fly probably the best place to start is to arrange a trial instructional flight, or TIF as it is commonly known. This is a no obligation flight where you will have the opportunity to fly the aircraft under the supervision of a qualified flight instructor. As part of your TIF you will receive a pre-flight briefing and about half an hour in the air, most of which you will be able to spend at the controls. If you have never flown an ultralight aircraft before, a TIF is an ideal opportunity for you to try out your wings and get an idea if it is something that you would like to pursue. It will also allow you to sample our flight instruction, our aircraft and our airfield and ask any questions you may have about flight training. The cost of a TIF is A$100 for 30 minutes or A$200 for a full hour and you don't have to be a member of Recreational Aviation Australia (RA-Aus) or Holbrook Ultralight Club to arrange a TIF. Not at all, if you can drive a car or ride a bicycle you will most likely have sufficient co-ordination to successfully learn to fly. Quality flight instruction is the key to achieving success. At Holbrook you will be trained by one of the best at a pace that best suits your learning style and time availability. Multi day and full time courses are generally available for those who wish to complete their flight training course in a shorter time and your airborne training will be conducted in a certified two seat training aircraft. 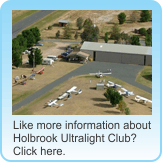 Holbrook Ultralight Club (HULC) hosts Holbrook Flight Training which collectively form one of Australia's most experienced ultralight flight training facilities, having trained well in excess of 1500 students since the Club was formed in 1985. At Holbrook Flight Training you won't just be trained to become a pilot, you will be trained to become a good pilot. Whether your aim is to fly for fun or you see it as a start to a professional career in aviation, you owe it to yourself to get started with the best and when it comes to flight instructors Holbrook Flight Training has one of the best in the business. What is required to learn to fly an ultralight aircraft? To learn to fly an ultralight aircraft in Australia you must first obtain a Student Pilot Certificate issued by Recreational Aviation Australia (RA-Aus). Your flight instructor will help you through this process and get you started as quickly as possible. To be eligible for an Australian Ultralight Student Pilot Certificate you must have attained the age of 15 years and be medically healthy to a standard that is equivalent to that required for the issue of a private motor vehicle drivers license in Australia. As you will be operating an ultralight aircraft under Australian flight conditions you must be able to demonstrate to the Flying Instructor that you are able to understand and carry out instructions given in the English language. If you are keen to have a go at flying but are a little unsure about whether ultralights are the way you want to go, arrange a trial instructional flight (TIF) for as little as $75. Also with a temporary RA-Aus membership you can receive up to three hours dual instruction prior to the need to apply for a Student Pilot Certificate. What is involved in getting an Ultralight Pilot Certificate? To complete the Pilot Certificate course RA-Aus requires that students complete a minimum of 20 hours of flight training, although most student pilots need more than the minimum number of hours to proficiently complete the course. Along with the airborne flight training you will also be taught the skills of aeronautical knowledge, flight rules and procedures, navigation, meteorology, map reading, radio procedures, airfield circuit procedures and general airmanship. There are two ground tests and one flight test that must be passed before you can be issued with an Ultralight Pilot Certificate. The first ground test is a simple written multiple choice test on the rules of the air, which must be passed before you can go solo. The second is the Basic Aeronautical Knowledge test, which must be passed prior to the flight test. Holbrook Flight Training's Instructor will not only help you develop the necessary skills and prepare for your tests, but will help you become a safe and competent pilot. Receiving your Ultralight Pilot Certificate will allow you to fly on your own, as pilot in command, within 25 nautical miles of you home airfield and service and repair your own aircraft. The next step that will broaden what you are allowed to do involves obtaining additional endorsements. The three initial endorsements that you may wish to consider are passenger, radio and cross country. The passenger endorsement will allow you to carry friends and relatives with you. This endorsement requires that you have at least ten hours as pilot in command, some of which must be in an approved two seat aircraft. You must also pass a check flight with a flying instructor. The radio operator endorsement will allow you to use an aircraft radio to communicate with other aircraft and ground stations. Obtaining this endorsement require some study and practical work. You will then need to pass an RA-Aus examination and practical test. Having a radio in an ultralight aircraft is not mandatory, but is becoming increasingly more important. It is a useful endorsement and can be gained concurrently with your basic flying training. The cross country endorsement allows you to fly anywhere in Australia outside of controlled airspace. This endorsement requires a minimum of three hours of dual cross country flying training, two hours of solo cross country flying training and you will need to pass an exam. Your Flying Instructor will also provide you with ground training on flight planning, meteorology, navigation and flight rules and procedures and help you prepare for this exam. As a student pilot at Holbrook Flight Training you will receive your flight training in a CA25N Gazelle that is a factory built certified two seat training aircraft. The Gazelle is certified to international (JAR-VLA) standards and has been designed and developed in Australia to handle harsh conditions and to meet international requirements. The Gazelle is powered by a certified Rotax 912A four cylinder four stroke engine whose reliability has been proven through thousands of hours flying under all conditions. The Gazelle is easy to fly and offers good visibility. It has full dual flight controls, a full VFR instrument panel and disk brakes, which makes training easier and safer and is fitted with a cabin heater, which makes winter flying more comfortable. The Gazelle cruises at 80 knots with two on board and has an endurance of more than two and a half hours, making it a capable cross country aircraft. The requirement is that the Student Pilot must complete a minimum of 20 hours general flying training, including a minimum of five hours flying as pilot in command (i.e. solo) before the Pilot Certificate flight test. 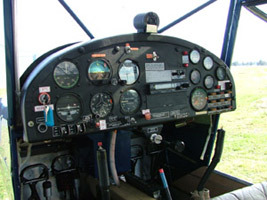 If a student was to complete his or her flight training to the required standard in the minimum number of hours then the total flight training costs would be about $4,000. Typical student time is about 15 - 18 hours flying with an instructor and 8 - 10 hours flying alone (solo). However, like learning to drive, some students will take a lot longer to achieve a satisfactory performance level in all the required sequences. The most important thing is to become a good pilot not just a pilot and Holbrook Flight Training can help you achieve this goal. Contact Holbrook Ultralight Club and we would be happy to assist you with any additional questions you may have.